As shady as "upstream supply chain" sources sounds when written by a venue like DigiTimes, the rumor is certainly interesting. The claim is that Microsoft is preparing its own brand of Windows 8 tablets, in cooperation with Texas Instruments and various Taiwanese OEMs/ODMs. There are several reasons, however, why what looks like a mere speculation, might have some merit. First off, Microsoft is one of the few companies that fully licensed the ARM chipset design last year, along with traditional chip companies like Qualcomm or TI. While this might have been to ensure access to ARM's architecture because of the plans to bring Windows to ARM-based devices, it might also mean some hardware plans are in the works, too. Microsoft is no stranger to using the screwdriver - Xbox 360 with Kinect and the Zune player come to mind. Moreover, Texas Instruments already announced that its new 1.8GHz multicore OMAP4470 chipset will be fully supporting Windows 8. Seeing how TI comes out on top in Android benchmarks, we'd assume its chips have impressed Redmond enough already. Microsoft is working with Qualcomm for Windows Phone handsets, using Snapdragon, but TI's silicon might have become preferable for its Windows 8 tablets. Acer already complained that Microsoft is imposing strict hardware requirements on OEMs for Windows 8 on tablets, making it difficult for them to comply, and that it is trying to control the whole process, Apple style. Obviously Redmond is actually trying to avoid subpar experiences and fragmentation of its "riskiest product bet", Windows 8, and the best way to do that is to do it yourself. Thus, borrowing a page from Apple's book, which is above all a computer company, reaching unbelievable operating margins by gating and controlling its hardware-software circle, Microsoft might decide to create a Windows 8 tablet of its own, be it only for reference purposes, like Google's Nexus handsets. Any thoughts? I just want a 3D glass-free screen tablet. Any os apart from ios would be welcomed with open-arms. 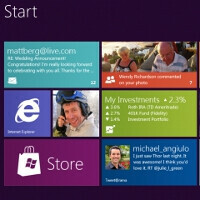 I think it's a brisk move for microsoft to lunch its own windows 8 tablet. Putting a strict guidelines on hardware shuold ensure taht performance would not be compromised by ohter add-ons(be it app or hardware)taht oftetimes affect OS performance. @Droid, Android Honeycomb might crowd the offerings, but that's why it doesn't run as smoothly as other softwares.